Where will the West’s next national monument be? Bears Ears isn’t the only local effort to get Obama to designate protections before he leaves office. While President Barack Obama has already designated or expanded 27 national monuments in the past eight years, more than any other administration, there are still efforts in many Western states pushing for the designation. Our map below shows the most well-known efforts such as Bears Ears and Gold Butte, as well as lesser-known efforts you may not have heard about. Click on each dot for descriptions of the proposal. 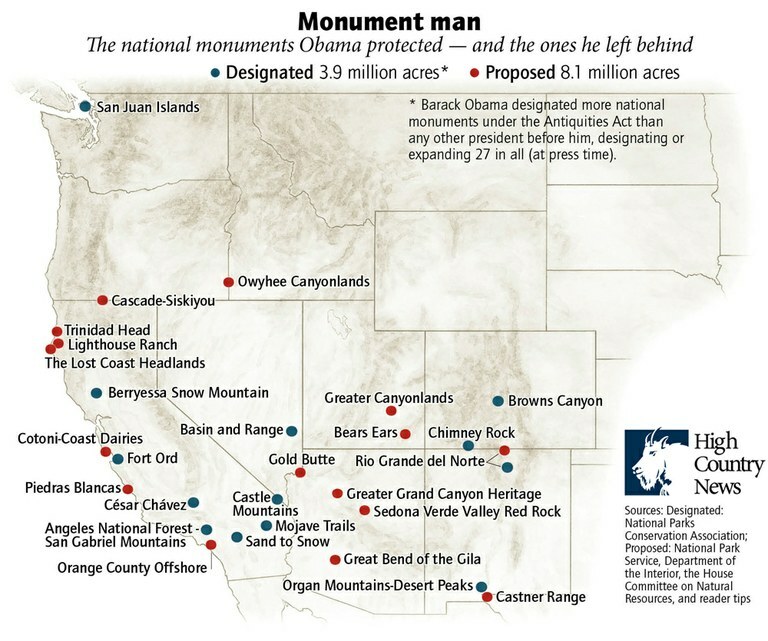 Since Dec. 28, Obama has designated an additional five monuments in the West. This map has been updated to highlight those proposals. Outside of the West, during Obama's waning days in office, he also designated three new monuments in the South on Jan. 12. Most monuments are managed by the National Park Service, though some are the purview of the Forest Service, U.S. Fish & Wildlife Service or the Bureau of Land Management. A designation doesn’t necessarily bring new funding, but usually creates stricter regulations for use that protect historical or natural landmarks. “Existing rights” that can include anything from property access and grazing to drilling and mining often remain intact but can be curtailed. Each monument’s regulations are unique and are outlined in management plans created by federal agencies, in consultation with locals. Monuments can be created by an act of Congress, or via executive order of the president under the Antiquities Act of 1906. For the latter, a grassroots effort first must present a proposal to agencies in Washington that oversee current management of the area, such as the Interior Department. The secretary of Interior generally makes a recommendation to the president, who makes a final decision. In California, national monument proponents are urging President Obama to add several thousand more acres in six coastal areas to the existing California Coastal Monument. It currently includes 20,000 rocks, islands and reefs within 12 nautical miles of the California coast. Sen. Barbara Boxer and Reps. Lois Capps, Anna Eshoo and Jared Huffman are leading the effort to add the new sites. *The interactive map was updated with the Owyhee Canyonlands proposed designation. Paige Blankenbuehler is assistant editor and Tay Wiles is associate editor at High Country News. Think we're missing a monument proposal on our map? Email us: [email protected]. Homepage photo of Cathedral Rock in Arizona, by Derek von Briesen.